Swiss Tempelle Pollution Defence Face Wash -Good Buy? 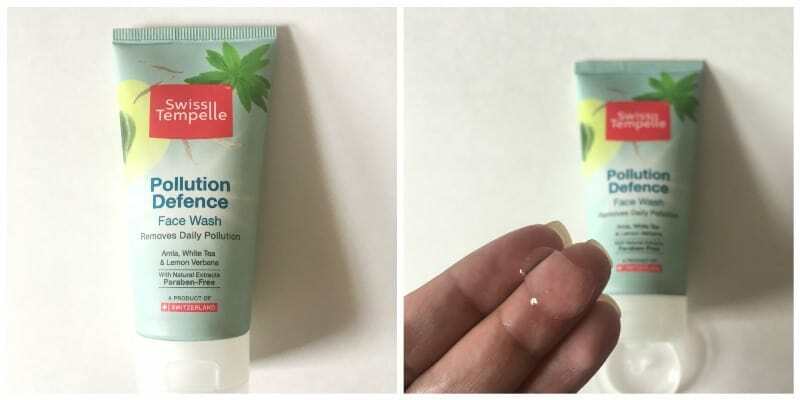 Home ReviewsBeauty Swiss Tempelle Pollution Defence Face Wash -Good Buy? Who is it for? Swiss Tempelle Pollution Defence Face Wash is for people looking for a squeaky clean face after the dirt, oil, and pollution build up. Gently massage onto wet face, avoiding eye area. Rinse off thoroughly. Use twice a day. No, skin tolerance is dermatologically tested. This face wash comes in a greyish blue plastic tube with a flip to open cap. The convenient size of 50 ml tube is travel-friendly. All necessary details are mentioned on the back of the tube. It is in form of a transparent gel which isn’t too thick or runny. One needs to take a good amount of this face wash and mix it with water in the palms because a small quantity is not enough somehow. It does not lather up and gets off the face easily when rinsed with water. It has a mild leafy fragrance which I personally didn’t like much. It contains artificial perfume in it. This face wash does not lather up but it cleanses the skin well, removing all traces of oil/ dirt/ pollution build up. However, a coin size quantity is required as a small quantity doesn’t cover the whole face. It has to make sure that your face is wet and that you mix the face wash with a little water in hands to make the application easier. I felt that this may leave skin pretty dry. So I am not sure if it would be the best option for people with dry skin type. On the other hand, it is apt for combination or oily skin types, or during the summers. Applying moisturizer afterward is advisable. All in all, it delivers what it claims, i.e., removes daily pollution. It doesn’t irritate the skin at all. The fragrance isn’t the best. Removes all traces of oil and dirt. Available in two sizes including a convenient 50ml pack. May dry out the skin. Little quantity is not enough. I would not recommend it to people with really dry skin. But it works well for normal to oily skin types. It is good for summer and pollution-prone areas. Maybelline Pink Power Creamy Matte Lipcolor – Is NOT What You Think!